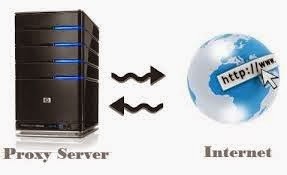 A proxy server is a computer that offers a computer network service to allow clients to make indirect network connections to other network services. There are many different types of proxy servers out there, but following are some commonly known proxies. Anonymous Proxy - An anonymous proxy server also known as web proxy, generally attempts to anonymize web surfing by hiding the original IP address of the end user. This type of proxy server are typically difficult to track, and provides reasonable anonymity for most users. Distorting Proxy - This type of proxy server identifies itself as a proxy server, but make an incorrect original IP address available through the http headers. High Anonymity Proxy - This type of proxy server does not identify itself as a proxy server and does not make available the original IP address. High anonymity proxies, only include the REMOTE_ADDR header with the IP address of the proxy server, making it appear that the proxy server is the client. Intercepting Proxy - An intercepting proxy, also known as a transparent proxy, combines a proxy server with a gateway. Connections made by client browsers through the gateway are redirected through the proxy without client-side configuration. These types of proxies are commonly detectable by examining the HTTP headers on the server side. Reverse proxy - A reverse proxy is another common form of a proxy server and is generally used to pass requests from the Internet, through a firewall to isolated, private networks. It is used to prevent Internet clients from having direct, unmonitored access to sensitive data residing on content servers on an isolated network, or intranet. If caching is enabled, a reverse proxy can also lessen network traffic by serving cached information rather than passing all requests to actual content servers. Transparent Proxy - A transparent proxy is a server that satisfies the definition of a proxy, but does not enforce any local policies. It means that it does not add, delete or modify attributes or modify information within messages it forwards. These are generally used for their ability to cache websites and do not effectively provide any anonymity to those who use them. However, the use of a transparent proxy will get you around simple IP bans. Further, your web browser does not require special configuration and the cache is transparent to the end-user. This is also known as transparent forward proxy.